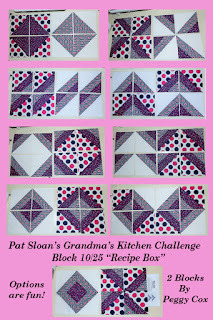 My "Pat Sloan's Grandma's Kitchen Challenge"
Working on 25 free quilt blocks from Pat Sloan on Facebook in her "Grandma's Kitchen Challenge." Adding them as I complete them. Expect to be using some ladybugs and polka dot fabrics on most of them. The block sizes are 12.5" x 12.5" unless noted otherwise. They'll finish off to 12 inches square when sewn into a quilt or the like. Been adding a white border to the smaller blocks in this series to enlarge them to this size. Every Wednesday Pat lists a different block for us to do. 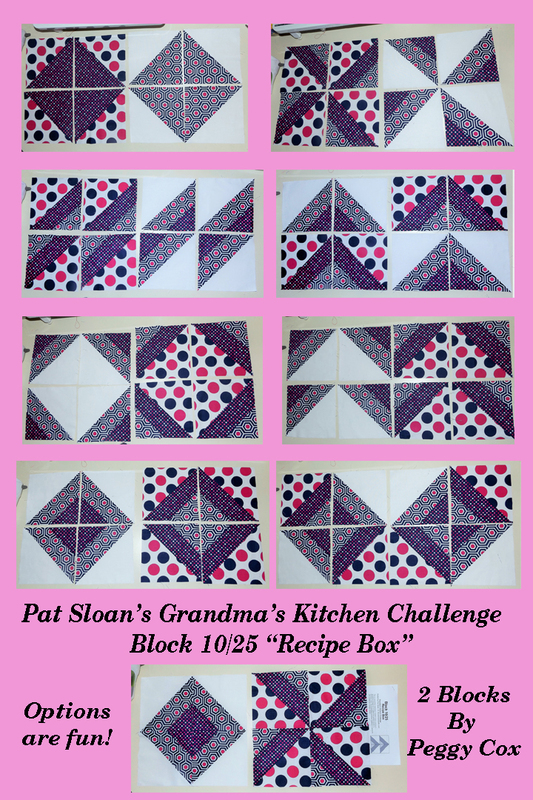 For more info on the challenge and these blocks, go to Pat's website, www.patsloan.com and follow the link there for her Facebook web pages and for this challenge ,which started up in June, 2017. Will try to get back here every week for the rest of the blocks as I make them up. 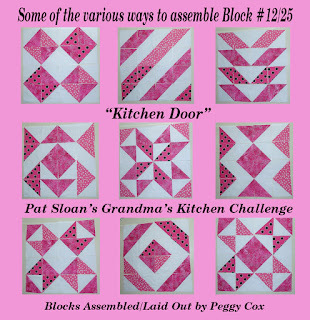 I bought a couple of Pat's quilting books from Amazon . com. which include "Teach Me To Sew Triangles" plus "The Splendid Sampler" (100 blocks) and "Teach Me To Machine Quilt" which I also have an earlier version of, "Learn To Machine Quilt" by another book company, published in 2007. This one I botched up while watching General Hospital on TV and at my sewing machine at the same time. The green blocks are supposed to touch each other, to form an "X" as shown on the instruction sheet, in the darkest colors on same. Didn't notice it until I had completed the block and, decided to leave it "as is" because I'd have to take just about the whole block apart to turn the 4 smaller (green and gray blocks) that are joined together to the larger center blocks (yellow gray and white blocks) that are attached to the larger green center block. With Block #10 we were given alternate choices, so, I did some experimenting with this one before sewing the blocks together, and, this is what I came up with. Went a different route on this one. Mine look more like color wheels. Instead of putting small fabric centers or buttons on them, I put pineapples in the center of them. The finished size on this squared block is 10.5 inches and 10" square when sewn into a quilt. Added iron-on pineapple appliques to the centers of the circles. Pat threw us a curve on this one. She gave us the option of multiple assembly of this block. Some of them are in the above photo collage along with the ones I choose from same... I made up two of them. More photos below. The two I made up. Block # 7 - oh My Stars! Stringing 2 Quilt Blocks Stringing quilt blocks isn't as hard as one may think it is to do. (You can click on the photos to enlarge them and to reduce them back to their original size or hit return if that doesn't work for you to down-size them) First of all, is the preparation, cutting the pieces of fabric up... I'm working with Half Square Triangles (HST) for making each of these two 12.5 inch quilt blocks. 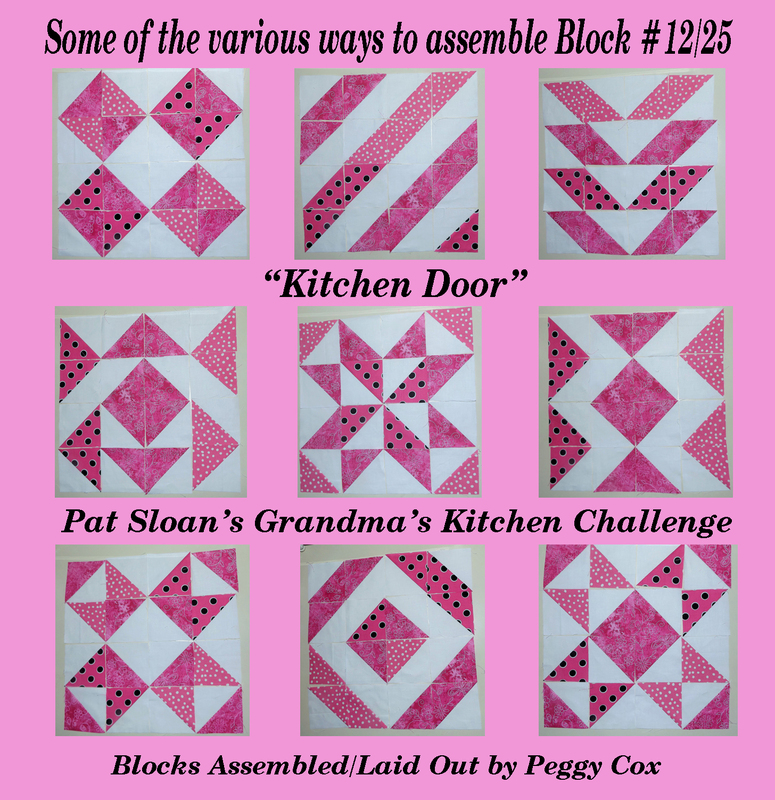 I'm using two different methods to make the pink quilt block up. I'll be working with both 4" and 8" fabric squares to do same. For the one with the PINK print: I'll be using four 4" squares of pink fabric and four 4" squares of white fabric. Plus one piece of white fabric 8" square and one piece of black fabric 8" square. From these, I'm going to end up with 16 HST's 3.5" square. Plus the saying is accompanied with a graphic design that I mustard up. Am a retired Grandmother, a crafty lady. Enjoying quilting and learning more about it. Been sewing for a little over 60 years on and off.